Key West has been a family vacation spot ever since I can remember. Family boat rides down the west coast of Florida and a stay at A&B Marina. Lots of laughs, family memories and scooter rides around this little island. This year I experienced Key West in a new and exciting way, as a 21 year old. I was stoked to be able to surprise my mom for her 50th birthday in the Keys, but of course that didn’t go as planned. Someone, not going to say names (Ted), threw a wrench in the plans forcing me to tell her the surprise to avoid the risk of her cancelling her trip. Regardless we had the best time and made oh so many memories. First up on this vacay was the excitement of staying at the cutest condo with the rest of our friend group staying less than a block down the road. Basically you can guess, it was a 24/7 pool party with the occasional bar hopping thrown in. Below I’m going to tell you about some of our favorite places, some family memories and some from this trip. 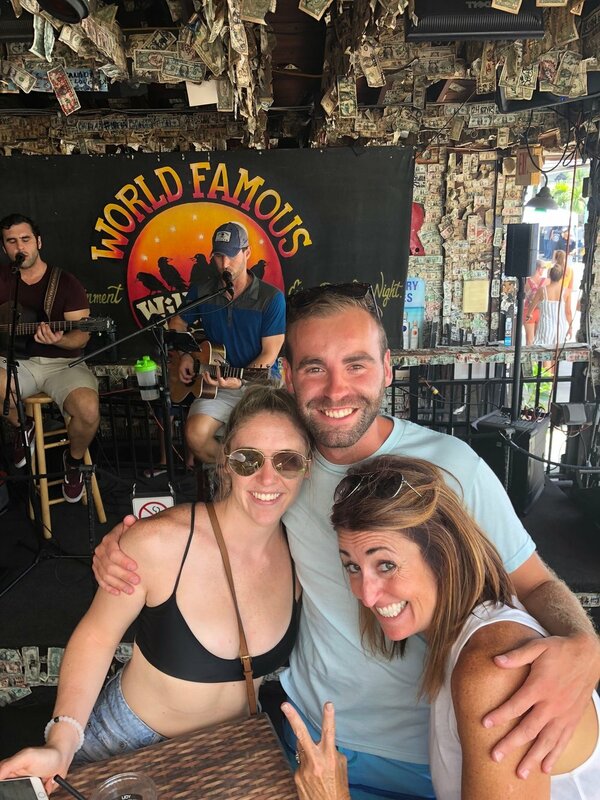 This one is a double hitter, a family memory and spot on our bar crawl. With live music, good drinks and bar food how can you really go wrong. With a corner spot on Duval this is a pretty safe spot to camp out at for a good time. Maybe it’s just my dad and me but I LOVE a good breakfast joint and boy is Pepe’s the place to go. Seriously I don’t think you could go wrong with anything on the menu. You have to stop in at least once while you’re there. This ones on the list simply because of how funny the performer on stage was. Anytime the entertainment makes fun of the people in the bar you know it’s going to be a fun afternoon. One caution is there is a camera behind the bar and those with internet access can watch you while you’re at the bar… Although another awesome Duval spot near Sloppy Joes. This. Place. Is. The. Place. Again, It may just be me but I’m in love with lasagna and lets just say my parents have a certain nickname for this places lasagna. It was really the only nice meal we ordered the entire weekend and it’s so good I don’t even care. “No I swear its right up here on the corner!” The comment of the weekend from my mom trying to justify having us walk what felt like an eternity. The long walk ended up being a funny story but not why it’s on the list, it’s on the list cause it has the strongest drinks! I’m not going to say much more than you have to go once. From the sunsets to the entertainment Mallory Square is a must. The street performers are so entertaining and by time you want to move on theres a 10 out of 10 sunset to take in. I can’t remember which sunset cruise we went on but it was such a great time. Slow cruising and watching a beautiful sunset really can’t be beat. In all honesty, my ABSOLUTE favorite thing to do is just scoot around the island on a moped. You get to experience Key West for all it’s beauty, quirkiness and everything in between. If I can suggest trying one thing while you’re there it’s taking a scooter ride.